It is a season of change for the College of Charleston Honors College, which has Dean Trisha Folds-Bennett excited. Among those changes (and perhaps the most momentous of the changes) is a new curriculum, which all students entering Fall 2018 and forward will complete to successfully satisfy all Honors College requirements. Exemplifying the heart and soul of the College of Charleston, the new curriculum centers on opportunities for students and faculty to be intellectually engaged. Dean Folds-Bennett, who has envisioned a new curriculum for over six years, explains the changes and the impact it will have on our future alumni. To see the requirements of the new and long-standing curricula, the latter of which still applies to students entering prior to Fall 2018, visit the Honors College website. What distinguishes the new curriculum from the long-standing Honors College curriculum? It is more flexible and more diverse. It affords more opportunities to both faculty and students – faculty to offer courses that they’re excited about and students to take courses that explore a broader diversity of topics. We were able to update our Honors College program goals – centering them on mind, self, and society – and then design a curriculum that reflects this time in history and the expectations that students and faculty have for study. Why launch the new curriculum now? The Honors College turned 50 last year, and although the long-standing curriculum wasn’t truly 50 years old, it essentially was. When I was interviewing for the dean position [in 2012], the curriculum was a significant part of the conversation I had with faculty and senior administration about my vision for the Honors College. Many expressed a desire for change during that process, and it’s something I committed to. It was the hope of senior administrators that the new dean wouldn’t be tied to keeping things the same. That fit for me because I had ideas based on my time as a professor and as Associate Dean of the Honors College. Who was involved in the development of the new curriculum? There was a lot of representation in the process. A broad range of faculty from all divisions, as well as deans, were involved in brainstorming and giving feedback. The Honors Committee, which includes both faculty and student representatives, and our Advisory Board, which represents our alumni and the greater community, were part of the process. For several years, we asked graduating students specifically about their experience with the curriculum through focus groups and surveys. Their input was essential. We had as many of our stakeholders weigh in as possible so that the resulting curriculum would meet expectations to the greatest extent possible. Has the curriculum been influenced by any trends you have noticed in honors colleges/programs or higher education in general? There’s a lot of conversation in the national honors profession about the evolution of honors college/program curricula and how rooted you are in the Western canon versus a more modern perspective. I’ve read the honors publications on this front, and I have been inspired by that work. There is currently a national call for honors colleges and programs to think critically about the way that we’re encouraging our students’ academic engagement. Options for special topics and interdisciplinary courses like Professor John Culhane’s, “We the People,” will expand under the new curriculum. There are also a lot of conversations about the nature of honors students. They tend to be independent thinkers, students who enjoy thinking outside the box or are longing to do that. They come here already well-read, their curiosity brimming over. What can we do to open worlds of opportunity for them? It would be logistically challenging to have a design-your-own-major curriculum, but we wanted to do something that felt like that and gave students similar flexibility. We rethought the calculus and Western Civilization requirements because those were requirements that were too structured and didn’t offer choice. You mentioned that the new curriculum meets the expectations of students and faculty members. Do you foresee that students will better meet the expectations of employers? The courses are all reading- and writing-intensive and draw from primary sources, which better equips students for adaptability in the workforce and academia. It also prepares them for the intellectual work that they will be faced with in graduate school, professional school, as well as the workforce. The more students write and the more they read complex texts, the more they are thinking about cross-disciplinary approaches and thinking critically. We want our graduates to be innovative problem solvers and integrated thinkers. How do the courses and requirements center around “Mind, Self, and Society”? For the mind, the curriculum is designed to stimulate intellectual curiosity, develop analytical skills, and expand students’ knowledge in a number of areas. It is also a set of requirements that encourages students to engage in self-reflection, deepen their self-awareness, and consider how their core competencies and values are translated into goals that serve not only their own needs but also the broader needs of society. Then, it’s the recognition that we live in context and as citizens of communities. Thoughtful, engaged individuals need to be involved in addressing the issues of that community, and we want to make sure that Honors students develop those habits. With these goals in mind, we have carefully considered the learning outcomes for each type of class in the curriculum and strengthened the Honors Engaged requirement to solidify it as a yearlong project. For the colloquia series, we’ve created several thematic categories that encourage faculty to think beyond the Western canon. There are still opportunities to teach from a Western perspective, but we’re encouraging courses on ethics, non-Western perspectives, diversity and sustainability, history and philosophy of science, and more (see the complete list of topics for the Exploring Complexity and Diversity Colloquia in the catalog). In all of those, we imagine courses that certainly have some disciplinary features but are also interdisciplinary and focused on broader themes. With the philosophy of science option, for example, we hope to see courses on climate and climate change. Within ethics, courses might help students explore their reaction to challenging situations where the answers aren’t clear. For self, other, and society, we want the social sciences and humanities to come together and think about the development of self in relation to others. The point is that all of these themes will encourage interesting topics that students might not have access to otherwise. There will be (and have already been) groans from alumni that incoming students won’t go through the Western Civ rite of passage. Can you explain the similarities and differences of the new colloquium series? What does this shift say about where the Honors College is headed? From all the work that we did with alums and current students, surveys and focus groups, we gathered a lot of information. We learned that the intellectual experience of the Western Civ course is highly valued. Consistently, we heard that it was a valuable investment of time. We heard that it is a course where students developed analytical skills. They appreciated reading and analyzing complex, primary texts across the disciplines. Completing the course felt good, like an accomplishment. We also consistently heard that the structure wasn’t working and was causing too many students to leave Honors. Whether it was a student-athlete that couldn’t attend an 8am lecture or a student studying abroad or a second-year science student with labs, the structure of six credit hours in the fall and six credit hours in the spring of sophomore year wasn’t sustainable. It was also difficult for faculty. It was a nine-hour commitment for faculty, and it was a lot for departments to release faculty members for that. Western Civ brought us wonderful and strange traditions like skits and post-exam celebrations. We look forward to making new traditions in the new curriculum! We also heard a good bit of feedback that only having an option of a course in the Western tradition seemed rooted in the past and we really needed to move forward and open the possibility for students to have a broader perspective. Although we will lose the cohort experience in this form, now we have a robust cohort experience in the first year that wasn’t fully developed before: Beyond George Street, Honors Engaged, and Academic Writing. It’s now a stronger and more intentional cohort experience than Western Civ was. We think that’s a good compromise. Honors Academic Writing is now required of all incoming students. Why is this course so important for students? 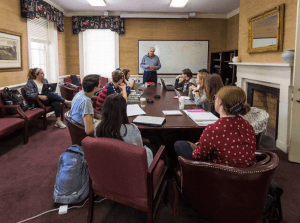 We believe that a cohort experience is essential in the Honors College, and with Western Civ no longer taking the same form, the Academic Writing course is a critical common experience for honors students. 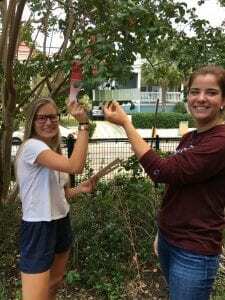 It forms a more complete first-year experience (FYE) for our students who aren’t taking the seminars or learning communities that other CofC students do. Academic Writing couples with Beyond George Street and Honors Engaged to be a substantial experience. Additionally, it is a course about scholarly writing, not just on how to write a research paper but a meta-writing course. It’s a course about writing that gets students to reflect on the writing process, the information and messages that they’re trying to convey in various discourse communities. As a scholar, you have to think about the audience that you are addressing. So, for example, as a scientist, you have an academic audience in peer-reviewed journals. But you also want to make your scientific discovery publicly accessible. In this case, you might write for a more mainstream publication, a media outlet, a blog, or even social media. We want students to understand all these communication outlets as important to academics and to professionals. How do you write in a way that is rigorous, well-resourced, but is also accessible to certain audiences? The Honors Academic Writing course is so crucial because it teaches students the techniques and thoughtfulness to respond to this dilemma. Students volunteer together at The Green Heart Project as part of Honors Engaged. Will the new curriculum and updated program goals change what you look for in Honors College applicants? While still being selective, it allows us to be more open-minded about whom we admit to the Honors College. In the past, we have, for example, had to focus on the math background of students. We still want students to have performed well in a range of disciplines in high school. But because students are not required to take a STEM-based calculus class (e.g. MATH 120), we will be less concerned about students who have not had a high school calculus course, instead focusing on the rigor of courses in other academic areas. Because we know that students can satisfy the Honors requirements in a more customized way, we can do a more holistic read of applications. What kind of opportunities for coursework do you hope this creates? I hope this allows and encourages more departments to submit course proposals. All the categories are now open for departments across campus to submit courses. The foundation courses – we’ve offered these for years but have clarified the learning outcomes – are great introductory-level options for students. As I mentioned earlier, we’ve designed thematic categories for the colloquia so that all disciplines can be included, and the advanced studies courses are a way to offer higher-level courses in all majors, especially where there are a lot of Honors students, as well as interdisciplinary courses. What opportunities does this new curriculum provide to faculty members and academic departments? It allows them all to be part of the Honors community. One goal that we have with the new curriculum is to offer more faculty development opportunities: getting faculty together for workshops that would stimulate interest in proposing courses, getting faculty together to talk about interdisciplinary collaborations. So, I think that one thing we got really excited about was not only what it would provide for students but also the faculty development opportunities on campus. We’ve wanted to do this, and this gives us a structure for workshops and sessions.